This gourmet version of baked macaroni and cheese makes an impressive, simple meal served with a nice salad or Spicy Green Beans. If you’re not crazy about Brie, substitute Gruyère or sharp cheddar for a milder but equally creamy variation. I also like cheapie cheddar with a little blue cheese for kick. Preheat oven to 350 degrees. 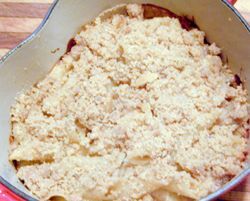 Butter a medium casserole dish or 4 individual 2-cup dishes and set aside. Boil pasta to al dente. Drain. While pasta cooks, melt 2 tablespoons butter in a large saucepan over medium-low heat. Sprinkle in flour and cook, stirring continuously, 2 minutes, to form a golden brown roux. Stir in milk and cream. Bring to a boil, stirring continuously, then reduce heat to low. Add cheese and continue to stir until melted and smooth, a few minutes. Salt and pepper to taste. Toss in drained pasta, combine very well. 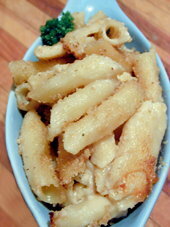 The idea is to let the sauce soak into the nooks and crannies of whatever pasta you’re using. Pour into buttered dish(es). Stir together bread or cracker crumbs with 3 tablespoons melted butter. Sprinkle evenly over dish(es). Bake 15 minutes or until topping is golden. Let stand a few minutes before serving. This entry was posted on Thursday, September 6th, 2007 at 6:01 am	and is filed under Main Dishes, Master Recipe Index, Side Dishes, Speed Queen (30 min/less), Vegetarian. You can follow any responses to this entry through the RSS 2.0 feed. You can leave a response, or trackback from your own site.